Well, there are times when lightning strikes twice in a same place. Once more, an album cover deceives our senses, because this beautiful and simple painting can’t describe the excellent musical work of the North American band NECROPANTHER. 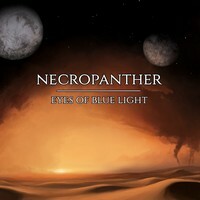 As it was on “Necropanther”, their first album, on “Eyes of the Blue Light,” you’ll find something really amazing. Their musical work evolved a lot since “Necropanther”. Obviously it’s the aggressive and thunderous Melodic Death Metal from before, but the band evolved both technically and in composing their songs. Their arrangements on each song are better, so their melodies are better understood now, and it’s not as difficult as it was on their first album to be hooked by their songs. No, they are easy to understand and they can make you jump out of the place you’re sitting to hear the album and start to bang your head as if tomorrow doesn’t exist! On the sound quality, a perfect work. But as we see the name of Fredrik Nordström in the production, we can’t wait something that isn’t perfect. He worked on a way that made all the aspects of the band’s music are perfectly listenable. Nothing is hidden, everything matters. The cover that can deceive you all is a very good work from Bob Million. Be prepared, because NECROPANTHER is hunting for you all! 12 excellent songs await you, so be prepared. The technical and catchy melodies of “Imperium Overture”, the aggressiveness of the guitars of “Good as Dead” (some of these riffs are really charming), the mix of brutality and melodic technique that is shown on “Kiss of Darkness” (what an excellent work from bass and drums), the slashing tempos of “Shai-Hulud” (these mixes between shrieked vocals and guttural grunts are really seductive) and of “Weirding Way” (beautiful melodic riffs can be heard here), the Speed/Death Metal essence of “Water of Life”, and the introspective melodies of “Strange Gods” are their finest moments. I truly recommend you all to pay attention on “Eyes of the Blue Light”, because NECROPANTHER is showing that they are a name to steal your hearts. Let yourself be seduced!